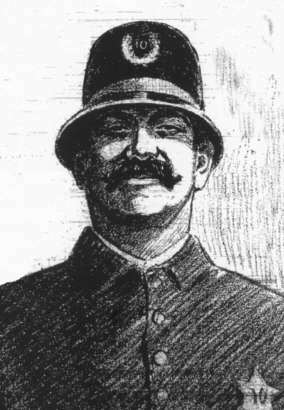 About 1:40 a.m. on Saturday, June 17, 1911, Officer William Cunliffe was walking his beat. There had been several burglaries in the area where cash, jewelry and clothing had been stolen. On the northwest corner of Summit Ave. and Columbia St., he encountered at least one male, but most likely two. We will never know exactly what transpired between them. The end result was that shots were exchanged. A suspect fired three shots. One .38 caliber bullet hit the officer just below his badge. It missed his heart, but punctured his left lung. Officer Cunliffe fired three shots from his Colt revolver. It was believed that one shot hit a suspect. Sgt. Fred Ribbach and Patrolman E. E. Sheumaker were a block and a half away when they heard the shots and rushed to the scene. They found Cunliffe on the planting strip. He was alive and conscious, but unable to speak and give any account of what had happened. Dr. E. M. Reninger’s house was on that corner of the intersection. Within minutes, the doctor was administering aid to the officer. Cunliffe was rushed to City Hospital at 4th and Yesler. His wife, Rebecca, was brought to the hospital from their home. She was by her husband’s side when he died at 3:20 a.m. He was survived by his wife and their two month old daughter, Mary Alice. At the time of the shooting, Mr. W. O. Peterson had just gotten off a street car at Broadway and Columbia. He heard two shots and saw some muzzle flashes, but he could not see who was shooting. He then saw Officer Cunliffe, stepping backwards into the street, raise his revolver and fire three shots before reeling and falling onto the planting strip. Peterson then heard one shot, but he never saw any suspects. Mr. M. Clamont saw two men go past his house. One man was supporting the other as if he were injured. Mr. Clayton Crawford saw one man enter his back yard and then disappear. Officers surrounded the house and waited until daylight to enter. Several people were taken into custody, but none were charged. Mrs. J. H. Brown was a guest at the Otis Hotel at Summit and Columbia. She heard some shots and looked out a window. She reported seeing only one man walk past the officer on the ground. The man calmly walked west on Columbia and went north in the alley towards Marion St. There were leads in the case which led nowhere. On June 21, 1911, a man identified as John W. Roberts walked into a Tacoma Police Station with a bullet wound to his thigh which was several days old. When police checked his account of how he was accidentally shot by a friend, they found it to be a lie. In August 1911, the Seattle Chief of Police received an anonymous letter postmarked in Salt Lake City. The letter identified one of three armed robbers, arrested in that city, as the murderer of Officer Cunliffe. A pocket watch, stolen in one of the burglaries in Officer Cunliffe’s beat, turned up at a pawn shop in Spokane. The owner of the watch had provided police with the serial number on the case and the serial number of the movement. In spite of these leads, Officer Cunliffe’s murder remains unsolved. William Henry Cunliffe was born in England around 1868. He was a plainsman and cowboy in Montana for six years. He was also a Mountie with the RCMP for five years. The first record of him living in Seattle is in 1907. He worked as a carman for the “S E Co”. He was commissioned as a Seattle police officer on January 4, 1908. On June 27, 1910, he married Olive Rebecca Jorgenson in Victoria, BC. Their daughter, Mary, was born on April 2, 1911. Officer Cunliffe is buried at Lake View Cemetery.